Vote for Agatha Christie’s Death on the Nile in HCC March Madness! How awesome is Agatha Christie’s Death on the Nile? It has ROMANCE: Spurned woman Jacqueline follows her ex-fiance and his new wife (Jackie’s best friend Linnet!) on their honeymoon. It has ADVENTURE: The murder takes place on a cruise of the Nile river. Luxurious cruise in an exotic locale — where better to commit a murder, eh? It stars HERCULE POIROT! Nuff said. Death on the Nile has been adapted for TV at least twice. The first one, in 1978, stars Peter Ustinov as Hercule Poirot, and features amazing actresses Bette Davis (All About Eve! ), Maggie Smith (Professor McGonagall, anyone?) and Angela Lansbury (best known for Jessica Fletcher from Murder She Wrote, but she’ll always be Mrs. Potts to me. Amazing novel, and just as exciting on TV! 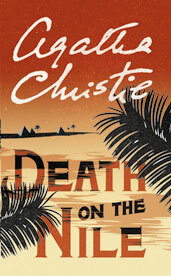 Death on the Nile is also competing in this year’s Harper Collins Canada March Madness. I say we get Agatha Christie into Round 2, eh? Best part, every day you vote, you are entered into a draw to win all 64 books in the tournament! Have five minutes? Head over to hccmarchmadness.ca and vote now! Vote for your favourite books in the tournament, and, just for our favourite egg-headed Belgian detective, cast a vote for Death on the Nile as well. 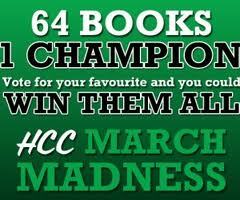 Need a bit of help choosing from all the books in HCC March Madness? Permit me to offer a few suggestions. And if you still haven’t read Death on the Nile, do read it. Such a great book! This entry was posted in Non-Book Review Posts and tagged Harper Collins by Jaclyn. Bookmark the permalink.